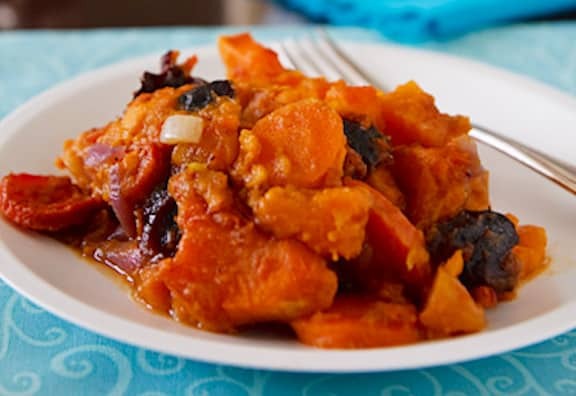 An Eastern European standard, tzimmes is a roasted vegetable dish that is made a number of ways, depending on the occasion. 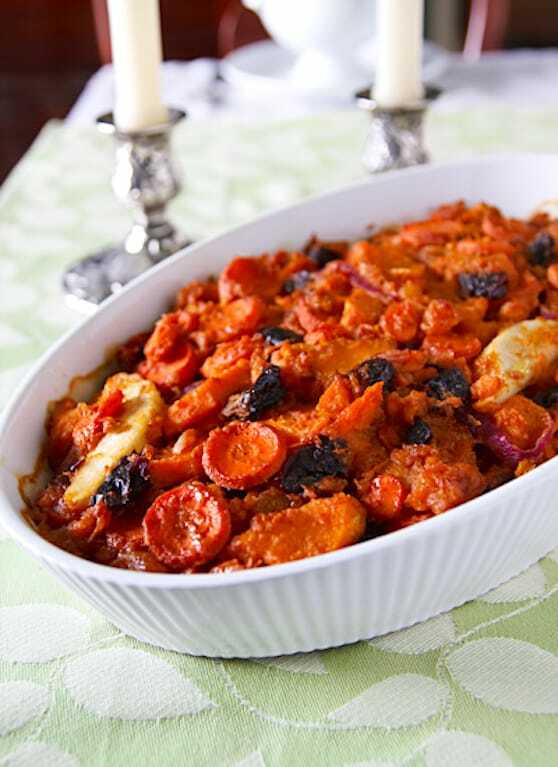 For the Jewish New Year, Rosh Hashana, the appropriate ingredients include carrots and sweet potatoes, with the added sweetness of fresh and dried fruits. Recipe adapted from Vegan Holiday Kitchen. Photos by Susan Voisin. Heat the oil in a large skillet. Sauté the onions over medium heat until translucent. Add the carrots and continue to sauté until onions and carrots are golden. In a mixing bowl, combine the onion-carrot mixture with all the remaining ingredients except walnuts. Mix thoroughly; don't worry if the potato slices break apart. Transfer the mixture to a large, oiled, shallow baking dish (a round or oval shape is attractive). Sprinkle the optional walnuts over the top. Bake for 45 to 50 minutes, or until the top begins to turn slightly crusty. Serve hot or warm from the baking dish. This is my go-to tzimmes recipe for all the Jewish holidays. My family and guest just love it. I will be making some for Passover. Thanks, Nava, for all your wonderful recipes for the Jewish holidays! It’s funny but in my family, tsimmes is a Passover thing! I so want to try your version this holiday Nava, based on Caroline’s rave reviews. It’s true, a lot of families do like tzimmes for Passover. While it’s a bit autumnal as far as ingredients, the sweet flavor is perfect for the symbolism of the Passover meal. Happy holiday to you, Wendy. Nava, I just had to pop in and tell you that I am making this again this year for Passover. I absolutely loved it last year! Thanks, Wendy! I hope you enjoy it again. I’m overdue to revisit this Tzimmes recipe. I found the recipe I was looking for, was scrolling down the page…your name – ATLAS – is the same as mine. It’s not that common so it really struck me. Now, I will follow your recipe for sure – How could I go wrong with an Atlas…Happy Holidays to you and yours. This was amazing. I made a couple slight modifications because of lack of ingredients: Instead of Orange Juice, I used the pulp and juice of 3 freshly squeezed oranges. I also did not have any Prunes or Apricots, but did have Figs and Dates so I used those in place. I could not ask for a more delicious treat. Thanks for posting this, I will be making this again!! Thanks so much, Jack — glad you enjoyed this. And I love your tweaks; this is a very flexible recipe. will this recipe work if it is prepared and refrigerated the night before baking? I have meringues in the oven already! Pam, that should work quite well. Enjoy! How far ahead can you make this recipe? Jodi, I’d say a couple of days would be fine. Then just reheat (covered) just before you need it.